Various “brand” titles flag cars that have been flooded, declared total losses, salvaged, or sold as junk. Odometer readings taken at each title transfer can reveal whether an odometer has been rolled back. You should be aware that not all U.S. states participate fully in the NMVTIS. So it's possible that some of a car’s title history may be missing. The NMVTIS website also mentions that you can inquire with a state's Department of Motor Vehicles to request a State Vehicle Record. Vehicle history reports also draw data from other sources, including insurance companies, auto repair service shops, and police traffic accident reports. But not all relevant data is captured. If a car is repaired without resorting (or reporting) to insurance, whoever repaired it may not report to Carfax or its competitors. Repairs may never have been made at all, yet remain hidden from easy detection. 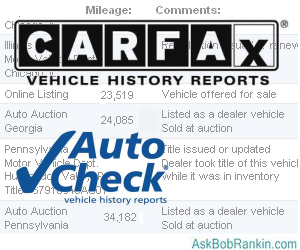 Many used car dealers provide reports from Carfax, Autocheck, or both. The reports lend credibility to their sales pitches. But buyers should not rely on a report from a single vendor. Just as one anti-malware program may miss an infection that another catches, Carfax may reveal red flags that Autocheck doesn’t, and vice versa. If a dealer won’t provide reports from both leading services, take the one offered and run your own report on the other. It’s easy and relatively inexpensive. You can find more car buying tips in my related article Online Car Buying Tips. Learn how to do all your car buying research (and maybe even your purchase) online. All you need is a car’s VIN (Vehicle Identification Number) or license plate number. Punch it in at Carfax.com or Autocheck.com and you’ll get a teasing summary of the car’s history. Pay a fee to download the complete report, which includes vehicle registration and title information, odometer readings, recall, accident and airbag deployment history, service and repair information, and vehicle usage (taxi, rental, lease, etc.) Both services offer package deals for shoppers who plan to check out several vehicles. A single Carfax report costs $39.95. If you researching multiple cars, you can purchase 3 reports for $59.99, or 6 reports for $99.99. Carfax does offer a few free services such as Odometer Rollback Check and Recall Check. One Autocheck report costs $24.95, or you can purchase 25 reports within 21 days for $49.99. If you're addicted to vehicle history reports, you can also get 300 reports for $100. The price differences do not indicate which service is better. Carfax is strictly in the vehicle history business, while Autocheck is a subsidiary of credit reporting agency Experian. Autocheck may well be a subsidized lead-generator for other Experian products. I'm certainly not saying that Carfax and similar services are dishonest or worthless. Just don't let a “clean” vehicle history report lull you into a false sense of security. The best protection against buying an expensive headache or paying too much is a hands-on inspection by an auto mechanic you trust. Vehicle history reports are just an intermediate step between a test drive and a mechanic’s inspection. You can find more car buying tips in my related article Online Car Buying Tips. Most recent comments on "[AUTO] Are Carfax Reports Reliable?" Thanks Bob. I knew about Carfax since many of the dealers provide them. I didn't know about Autocheck. So the next time I buy a used car I will get both. Long story, a few years ago I bought a new BMW which I eventually traded for another new car. I got a call from the dealer accusing me of trading a car that had been damaged in an accident re: a carfax report. No such thing happened. There had been hail damage to the paint only. Carfax refused to correct. I will never rely on carfax. A few years ago when searching for a new used car, I purchased multiple Carfax reports for vehicles I was considering purchasing prior to visiting the dealerships offering them. On several occasions, I found Carfax reports already posted on the vehicles which differed markedly from those I purchased. Not surprisingly, the free Carfax reports the dealerships posted on the vehicles I was considering were much more positive and often lacked multiple (and in my opinion significant) entries which were listed in my Carfax reports. Some even noted only one prior owner when my Carfax listed multiple. When I would question a salesperson regarding the discrepancies between the reports, I was always told mine was incorrect or not as recent as their report despite the fact that I purchased each one just prior to visiting the dealership. Needless to say, I quickly left those dealerships to look elsewhere. And I agree that you should always have a mechanic you trust inspect a used car prior to purchasing. We checked Carfax before buying a used vehicle that purportedly had rear end damage. However the car clearly had a new front quarter panel and hood that was a slightly different color and didn't line up properly. Carfax showed on the rear in damage but clearly it been in a front end accident. Then we decided to check on our own car that we had previously traded in because it had been flooded completely-Immersed in water. We love the car and would've kept it except for that it started to have problems with the wiring shorting out. There was nothing in the Carfax report about water damage. We will never trust Carfax. From personal experience, CarFax and AutoCheck are unreliable at best. As Bob noted, one should not rely on a single anti virus or malware program. It's the same with CarFax an others. They are simply one tool and they provide some information, and it's better than nothing. But don't rely on them completely. As consumers. it's our responsibility to research our car purchases and we cannot mitigate that to a single source. My wife drove her car off the edge of the road just barely into a ditch. We could not back it out and needed a tow truck. There was some front suspension damage and some to the A/C lines. But the air bag NEVER deployed. It was fixed at a reputable body shop and our insurance paid for it, minus the dedictible. Checking Carfax later, it reported the car as having had the air bag deployed. It NEVER happened at all!! We know the history of the car since we bought it brand new off the dealer's lot. As Bob said, Never rely on one source. I used to use Autocheck back when it was free for car shopping. When they started to charge for every report, they became like the others. They only provide what they are given. I don't trust any of them as a sole source. If you're in the market for a car, try googling the VIN number. Sometimes you can get lucky. Quick story; we bought our daughter a used Subaru Impreza from a local dealer who provided us with a clean Carfax report. About a year later we took the car to our mechanic for some brake work. He told us and showed us that the car was previously rear ended with substantial damage. Something that was not mentioned in the Carfax report. In the end though, our daughter drove that little Subi for years and beat it into the ground and then sold it for a good chunk of change. We learned our lesson but had a happy ending. "... an auto mechanic you trust..."
CarFax is a private business and there is no legal requirement to report ANYTHING done to your car to your local Government, much less CarFax. For example, when my kids were young drivers my youngest Son had a couple of accidents. I paid to have them professionally repaired out of my own pocket to keep the accidents and their cost off my insurance. So, was I breaking the law or doing anything immoral? No. But had the cars been in accidents? Yes. Does the next owner need to know? No, as long as the repairs were done correctly, and they were. Bottom line is, CarFax is just a starting point and there are far more things that can go wrong with a car that are never reported to the service. Like, how often was the oil changed? Or was the car driven by a kid-racer who beat up the drive line with his driving style? Do yourself a favor and pay a good independent mechanic to look at anything you consider buying that's more than three years old or has more than 45,000 miles on the odometer. Unfortunately, many people think Carfax is like gold. But, it is only as good as what is reported, which may be incomplete or incorrect. Shop makes errors in the paperwork? bad information. Employee of any involved entity enters data wrong? Again, bad data. This can affect not only buyers, but sellers as well. Recently, a dealership service writer made an error on the mileage of my car (5,000 miles higher than actual.) This was reported to Carfax. The dealer fixed the error and gave us new paperwork, but I don’t know if Carfax will ever fix it. At some point, it’s going to look hinky, because the next reported service will have lower miles than the last. This doesn’t look good to potential buyers. If a VIN is incorrectly recorded when an accident is reported to Carfax, it may very well appear your car was in an accident that never took place. There goes your resale value. For buyers, if you do want a Carfax from a dealer, don’t settle for the paper one sitting in the car that’s been on the lot for two months. Ask for a fresh pull. That accident the last owner was in right before trading it in probably didn’t show up on the one pulled two months ago at trade in time. And, keep in mind, these a just tools. They can’t replace an inspection. Carfax is only one tool to use when considering a purchase, and it is a poor one at that. It can only contain what has been reported, thus a lot of "dirt" is kept out. I bought a used car whose Carfax shows a normal record. Any cursory exam shows dents, one back door that has to be yanked open with some strength (with both hands) and a repaint job that no doubt was hiding a lot more. It did show a previous title from another state. That state, however, is known as a place where used car sellers often "wash" titles. Why did I buy it? It was cheap and the working innards were in great condition (probably rebuilt). Still running well. My husband lightly bumped a cement parking divider with his older car. His airbag went off, even though it shouldn't have (the mechanic said the bump was at a weird angle that set the sensor off). Carfax forever showed airbag deployment seeming to indicate an accident. How fair is that? "this is a fake report" because it never happened. when where who...etc,, I just don't understand why they (dealers) still keep those Repair/Maint. Department. They can do much better without thirdparty.